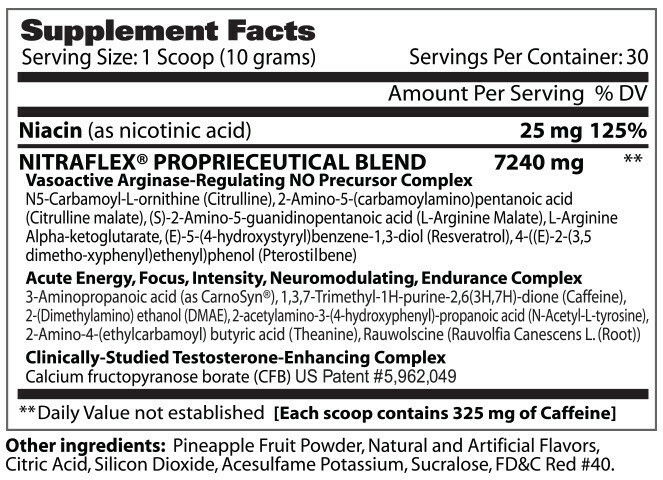 Unique Properties of some of the key compounds in Nitraflex: 1-Scoop Potency: Nitraflex is so potent, only 1 scoop (1 serving) is necessary. Do not exceed 1 scoop in a single 24-hour period. Do not take Nitraflex with 5 hours of bedtime. 6 Weeks of Testosterone: Calcium fructopyranose borate (CFB) has been shown to increase testosterone in health subjects. The average increase in total and free testosterone in a 6-week study was 56% and 29.5% respectively. In a second study, total and free testosterone increased on 3 hours after a single dose of CFB. Creatine-Free Formula: Creatine causes water retention, which can male achieving a dry, hard muscular look even more difficult. Sometimes creatine is added to products precisely for this reason. We left it out of Nitraflex precisely for this reason. This making Nitraflex ideal for pre-contest prep and lean muscle physique. Training days: Day 1: Begin by assessing your tolerance with half a scoop (1/2 scoop) of Nitraflex mixed with 6-8 oz of cold water. Days 2 and beyond: Depending on tolerance, mix 1 serving (1 scoop) of Nitraflex with 6-8 oz of cold water and consume within 30 minutes before working out. Non-training days: Take 1 serving (1 scoop) open arising in the morning or before any physical activity. Do not take more than 1 serving in a single 24-hour period. Do not take within five hours of bedtime. Special Times to use (Take 1/2 to 1 Scoop): take before martial arts, Take before powerlifting meets, Take before long distance runs or intense cardio sessions, Take before any type of weight training, Take before sporting events, Take anytime extreme energy/focus is needed, Take before exams or anything that requires mental recall. The product gives you a feeling of disposition without causing tachycardia or leaving you with that aspect of "ligadão", because it has no caffeine in its formula and also has no creatine, which for me, it is a relief, because it does not leave me with an inhaled volume, and not very defined. NITRAFLEX é de fato o melhor pré-treino para ter um PUMP INSANO com as veias saltando e os músculos inchados! Sua composição é ótima para treinos de força e com cargas altas. Mantive um bom desempenho o treino todo com uma ótima vascularização. Sem duvidas é um dos melhores para mim e indico de olhos fechados! NITRAFLEX is indeed the best pre-workout to have an INSANE PUMP with bouncing veins and swollen muscles! Eu comprei este pré-treino sem conhecê-lo, apenas pelas reviews disponíveis aqui, no site. Não me arrependi. Boa disposição, nenhum efeito e sabor agradável. Recomendei para amigos que também acabaram comprando e gostando. Tenho usado ele agora, alternando com algumas outras marcas. "One of the best, currently." 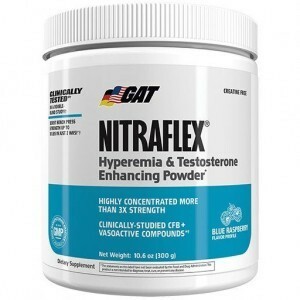 We have a large selection of in-stock GAT Sport products including German American Technologies items and others for the lowest prices at SameDaySupplements.com® It's always easy to shop for GAT Nitraflex, Pre-Workout at SameDaySupplements.com because you can browse by reviews, brand, prices or search for specific ingredients using our search tool. In-stock orders placed before 3pm EST ship out the same day to USA, Brazil, United Kingdom, Canada, Germany, Australia, Japan, India, France and worldwide at the cheapest prices online.